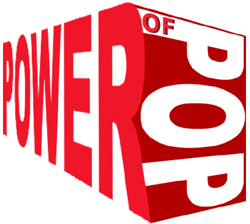 Welcome to The Power of Pop Volume I -- basically an archive of my stuff found at the original site that was shut down by NBCi sometime in September 2001. I Want To Reinvent You Now! The GBV Special! REVIEWED! 1.7.01 featuring Cockeyed Ghost, Tim Easton, Reeves Gabrels, Mother May I, L'altra, Stickman, Autoliner, Rebecca Gates, Mission to Mars, Cliff Hillis, Frog Holler and Mum & Dad. REVIEWED! 15.5.01 featuring The Rosenbergs, The Orgone Box, Girls Say Yes and SWAG! REVIEWED! 1.5.01 featuring Red Letter Day, Solid for Sixty, Eleni Mandell, Bee Gees, The Fast, Melvern Taylor, Peter Searcy, Adrian Shaw, Guide to Entertaining and Shoe Fetish. REVIEWED! 1.4.01 featuring The Montgomery Cliffs, The Fletcher Pratt, Graig Markel, John Newlands, Lola Barbershop, Matt Easton, Reverend Horton Heat, Walon Smith, The Alice Project and Insanity Wave. REVIEWED! 1.3.01 featuring Chewy Marble, Mark Kozelek, Farrah, Nixon's Head, Starling and Linus of Hollywood. REVIEWED! 15.2.01 featuring The Marlowes, Ken Kase Group, Stephen Bunovsky, Bitchin' Wheels, Crash Into June, Lofty Pillars, Longwave, Ringles, Brad Brooks, Tony Low, Fake Brain, The Agents, The Nields, Smallstone, Sunny Day Real Estate, Josh Rouse, Barnyard Playboys, Robert Crenshaw. REVIEWED! 30.1.01 featuring The Gentlemen, Rusty Squeezebox, The Jupiter Affect, Kitty in the Tree, Thirst, Fear of Commitment, Glowfriends, Solipsistics, Squirrel Nut Zippers, Grand Tourism,The Caribbean. REVIEWED! 15 Dec 2000 including Possum, Bat Country, Early Edison, Arch Station, Lu Bango, Sparkwood and more. (P) + (C) 1999 - 2001 KEVIN M MATHEWS.